Tom Pyatt can’t wipe the smile off his face these days. His return to the NHL after spending two seasons in Switzerland, to hone in on his game while playing alongside his brother, has gone even better than expected. 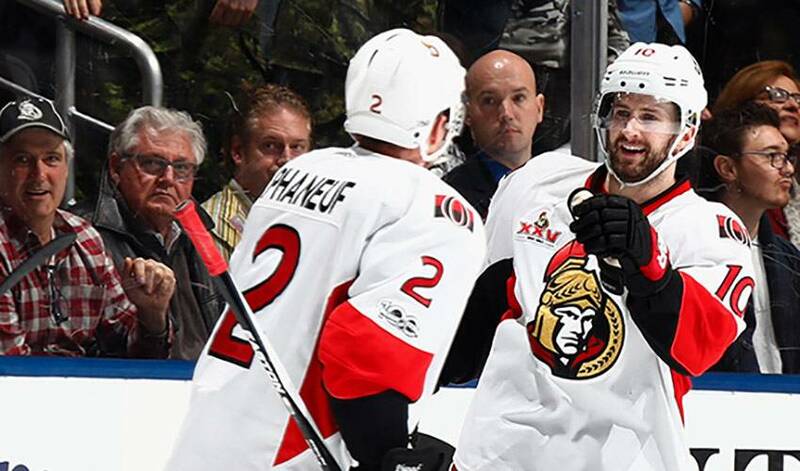 Tom Pyatt can’t wipe the smile off his face these days. His return to the NHL after two seasons in Switzerland has gone better than expected. Not only are his Ottawa Senators in good position (second in the Atlantic Division) heading into the All-Star break, but Pyatt has contributed to the Senators' cause with his checking and penalty killing talents - as well as some unexpected offence. The 29-year-old left wing from Thunder Bay, Ont. has four assists in his past five games and scored the shootout winner in a 3-2 road victory against the Toronto Maple Leafs last Saturday. “It has been nice to be back and it’s nice to be in a winning situation,” Pyatt said. He comes from a hockey family. His father Nelson played 296 career NHL games with the Detroit Red Wings, Washington Capitals and the Colorado Rockies in the mid-to-late 1970s. His older brother Taylor was blue-chipper, a first-round selection (eighth overall) of the New York Islanders in 1999 who went on to play in 13 NHL seasons with the Islanders, Buffalo Sabres, Vancouver Canucks, Phoenix Coyotes, New York Rangers and Pittsburgh Penguins. The Rangers selected Tom Pyatt in the fourth round (107th overall) in 2005 and later strutted his stuff with back-to-back gold medals with Canada at the 2006 and 2007 world junior tournament. Still, the strong skating 5-foot-11, 181-pound Pyatt split his first year of pro in 2007-08 with the Hartford Wolf Pack of the AHL and Charlotte Checkers of the ECHL. He appeared to be on his way to a long and productive NHL career after he was included in the Scott Gomez-Ryan McDonagh trade and landed with Gomez in Montreal. Pyatt helped the Canadiens reach the 2010 conference finals, but he was on the move again in the summer of 2011, signing with the Tampa Bay Lightning. In his third season in Tampa Bay, Tom suffered a broken collarbone early in the year and had his season limited to 27 games. As a result, there wasn’t much interest in him when he became an unrestricted free agent in the summer of 2014. So he signed to play in Switzerland’s Geneve Servette HC based in Geneva in order to play with his brother Taylor in 2014. Taylor is six years older, and although they played against each other in the NHL, the Pyatts never were teammates. “I went to Switzerland not to finish my career, but to work on my game, my skills and it was a chance to play with my brother,” Tom said. Two of Pyatt’s teammates in Geneva were former NHLers Matthew Lombardi and Matt D’Agostini. The three also played together on Canada’s winning 2015 Spengler Cup team. While in Switzerland, two of the opposing coaches just happened to be Guy Boucher and Marc Crawford. Both were hired last spring as head and associate coach of the Senators, respectively. That familiarity landed a one-year, two-way contract for Pyatt in Ottawa. “I also had Guy as my coach in Tampa Bay for a while,” Tom said. “Being familiar is the main reason I signed here. Matt Duchene might not have been looking for a birthday gift, but he wound up getting a memorable one any way. When it comes to hosting an incredible weekend of hockey celebrations, the “Luck of the Irish” was not needed for the community of Lucan, Ontario.